While at Fresh Brothers' tasting at Redondo Beach a few weeks back, the owner recommended that I check out Grow in Manhattan Beach. Grow had some great gluten free options, and I picked up a box of 1-2-3 Gluten Free Brownies. I had never seen the brand before so I decided to give it a go. 1-2-3 Gluten Free also makes chocolate chip cookie, buckwheat pancake, devil's food, and sugar cookie mixes. One of the salespeople at Grow was very helpful and told me that 1-2-3 Gluten Free mixes could be split in half because the mixes were so big. I took her advice and split the bag in half; I tried to adjust the recipe accordingly but I'm not the best baker. When I took them out of the oven I noticed that they had puffed up like a cake instead of staying low like a brownie. Was this my fault or is this how 1-2-3 Gluten Free brownies bake? Either way, the brownies came out great -- they were moist and, with the chocolate chunks included in the brownie mix, were doubly chocolatey. Sorry that I'm making up words today, but it's Halloween, so it's OK, right? Overall, I really liked the 1-2-3 Gluten Free brownies. However, there was one enormous problem with the brownies: they were super expensive. The box cost around $16! I'm not sure if this was a crazy mark-up by Grow or if this is how much 1-2-3 Gluten Free Brownies cost; either way, they were inordinately expensive. The box did yield two servings so I suppose that that amounts to "only" $8 per serving. While I enjoyed the brownies, I think I'll stick with Betty Crocker's Gluten Free mixes were now, since they are less expensive and taste great. I did appreciate how moist the 1-2-3 brownies were the day after baking them, I think the Betty Crocker mixes are just as good and half the price. A representative from New Harvest Naturals recently contacted me and offered to send me samples of the company's gluten free products. Of course, I happily obliged. New Harvest Naturals became entirely gluten free in 2005, when the company's CEO was diagnosed with Celiac Disease. In addition to the pound cakes New Harvest sent me, they also make gluten free challah muffins in a variety of flavors and gluten free chicken meatballs in two flavors. In addition to being gluten free, New Harvest is also dairy free and kosher. Now for the important part -- how do they taste? In a word: terrific. I tried the marble pound cakes first, and was very happy with the way they tasted. Gluten free eaters know that when imitating gluten filled food without the gluten it is very easy for the results to go awry. 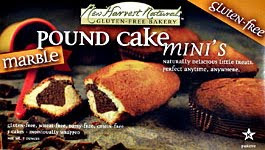 Such is not the case with New Harvest Natural's mini pound cakes. They were soft and well flavored. My only complaint about the marble pound cakes was that the marble was not swirled into the pound cakes. Instead, the marble was often a distinct half of the marble cake. I would have preferred a more traditional swirled marble cake -- perhaps my box was filled with flukes, but they were all similar to the picture at left. In addition to the marble pound cake I received a box of classic pound cakes and a box of raisin pound cakes. The classic marble cakes were also great. Of course they didn't have the chocolate flavor like the marble cake, I still devoured them pretty quickly. Last but not least, the raisin pound cakes. These just weren't my thing -- raisins in bagels, bread, muffins, or anything similar is not my bag. I did suffer through eating one for you, my readers, and it had the same texture and consistency as the other kinds of pound cakes. I'm not sure if these are available in stores yet in Los Angeles; I've asked the representative who contacted me and will update the post when I hear back. In the meantime, you can buy them through the link below! To celebrate my friend Ashley's 23rd Birthday I headed down to Laguna Beach this past weekend. Her friends from the Bay Area were joining us and it was sure to be an over-the-top weekend -- that's how Ashley always does it. I was a bit concerned about eating over the weekend; in past celebrations with Ashley there's a lot of bad eating going on (think late-night snacking and junk food) and it is sometimes difficult to eat gluten free. 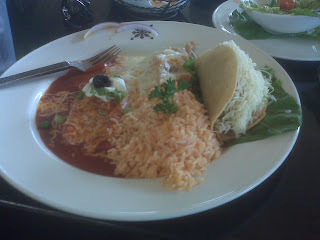 When we were deciding on lunch places, I suggested Javier's because of its great Mexican menu. Mexican food is typically Celiac-friendly because of the abundance of corn products. 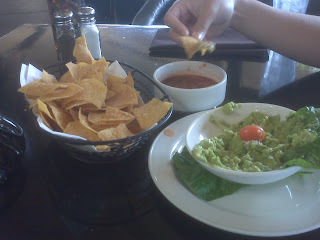 As we sat down I was very careful to ask about the chips they served as an appetizer. I was told that they were 100% corn and that there was no flour or anything similar used in them, the salsa served with them, or the guacamole we ordered to go on the side. When I continued to ask about corn being used instead of flour in the restaurant's enchiladas, the waiter asked me, "Are you gluten free?" Ashley and I were both pleasantly surprised that the waiter knew about the gluten free options on the menu. He assured me that the enchiladas were also gluten free, as they were made from corn. The enchiladas were awesome. They were served with rice and a taco; the taco was also made out of corn. The enchilada was smothered in delicious cheese and the meal was extremely filling -- neither of us needed to eat dinner after the enormous portions they served up at Javier's. The best part? 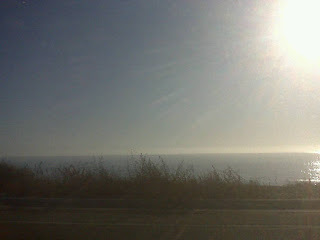 Overlooking the Pacific Ocean while snacking on delicious food. Doesn't get much better than that. A few nights ago I was lucky enough to have dinner at my favorite pizza place in Boston - Stone Hearth. As if it wasn't enough that they offer gluten-free pizza and pasta, they also patronize local, organic farmers whenever possible! A match made in heaven. We went to the cozy Cambridge location, whose handful of tables were filled with happy diners. I befriended an adorable toddler named Nora while we perused the menu. My two co-workers and I were most tempted by a classic Magherita and my go-to, the Peperonata. We were a little disappointed to find the GF crust only comes in one size, 12", so instead of splitting a large we ordered two smaller pies. The waitstaff seemed very cognizant of dietary restrictions, making the experience that much more enjoyable. Every time I go to Stone Hearth I am impressed with their pizza, and I was not let down. Our pizzas came out piping hot, smelling of fragrant basil and smoky cheese. Their crust is just how I like it - thin & perfectly crisp, with no strange or cloying flavors often found in GF breads. I can't get over how well the caramelized onions, roasted peppers, and fontina cheese blend in the Peperonata. My non-Celiac friends devoured the pizzas, unable to differentiate them from wheat-containing crusts. Unfortunately we were unable to save room for dessert , but I was happy to see a number of GF options: brownies, cookies, and gelato! I should also mention they serve GF beer as well as Original Sin Hard Cider, one of my favorites. So far, Stone Hearth is my top recommendation for Celiacs in Boston. Prices are reasonable (though they do add $2 charge to all menu items ordered GF), and there is a good variety. I hope in the future they offer more topping combinations on the GF crust, so far there are only four. Next time I vow to try a pasta dish and dessert! After a tasting of Fresh Brothers' gluten free pizza (check out that post here) I stopped by Grow on the recommendation of Fresh Brothers' owner. The shop has a great selection of gluten free products, including Cherrybrook Kitchens and 1-2-3 Gluten Free. They also carry a large selection of The Sensitive Baker's products for those of you South Bay residents who can't make it up to the bakery's Culver City location. Fresh Brothers' owner recommended The Sensitive Baker's breadsticks to me, so I was sure to buy a package of them. I tried one when I get home (despite being ridiculously full from Fresh Brothers) and they were almost as good as Risotteria's; I'm sure if they were fresh out of the oven they would be just as good. The produce in Grow also looked great, although being so full from Fresh Brothers I could barely look at any more food than the breadsticks and brownie mix (which was already probably too much!). Grow is a great place for South Bay people to pick up the Sensitive Baker's products without going up to Culver City; the employees of Grow were also knowledgeable about their gluten free options. I recently reviewed my "New York" tab and was surprised to see that I hadn't written about Risotteria yet. Risotteria was one of the first restaurants I went to with an extensive gluten free menu. 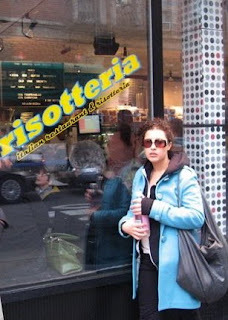 My fond memories of Risotteria were also jogged by a picture my friend Clara sent me recently. She's accompanied me on many trips to Risotteria over the years. Risotteria is a tiny restaurant in New York's West Village which serves gluten free risotto, pizza, paninis, and salads. They also have awesome gluten free black & white cookies, whoopie pies, and other assorted desserts and serve Redbridge gluten free beer. I love that the breadsticks are gluten free and delicious -- these are some of the best breadsticks I've ever had, gluten free or not. My favorite option on the menu: the paninis. You Celiacs reading this know how difficult it is to find a great gluten free sandwich. If you check out Risotteria, you will not be disappointed with the thick, flavorful bread used for the paninis. I like the mozzarella, tomato & pesto. Risotteria's gluten free options are awesome for Celiacs -- it's definitely a great place to check out next time you're in New York City! Do you love it or do you love it? The below video is really great, and shows that many young Celiacs don't have to worry about eating gluten free when making the transition to college. I definitely applaud Syracuse University's efforts to make the transition an easy one as both a Celiac and a former "central" New Yorker. Of course, that is just one college in the country. However, my alma mater was also extremely helpful in my adjustment. I was diagnosed with Celiac the summer after my freshman year. 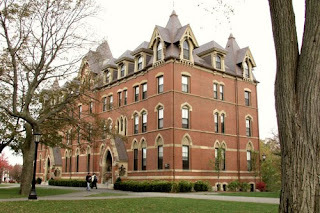 During that summer I lived at another college in Boston and had a horrible, no good, rotten experience at the other college with eating gluten free; it made the initial adjustment very difficult. When I went back to Tufts in the fall, I contacted the school's nutritionist who was eager to provide me with gluten free pasta, cereal, and cookies. Just as importantly, she provided me with information about any hidden gluten in the dining hall. She and the dining hall staff went to great lengths to welcome me as a Celiac. Whenever I went behind the counters I was treated like a local celebrity, since the entire staff was aware of my gluten free needs. They would also grill items and serve them to me without particular sauces which contained gluten. If you have any concerns about eating gluten free in college, I definitely recommend meeting with your school's nutritionist, dietitian, or dining hall manager to see what options are available. I also just found this great pamphlet that Tufts publishes for its students with food allergies, intolerances, and sensitivities. I wholeheartedly echo Ruth Sullivan's comment that many students wish they could go back to the dining hall. I know I do -- cooking for myself and doing the dishes is way too cumbersome! Thanks to Gluten Free Optimist's original post for the video. 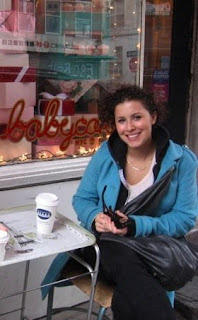 On her site (here), she also has an article about eating gluten free at the University of Maryland. I just went to brunch at one of my favorite gluten free restaurants, Hugo's. While walking through the West Hollywood Farmer's Market with my friend Sarah, another friend Iman messaged me and told me she was in the neighborhood and feeling hungry. 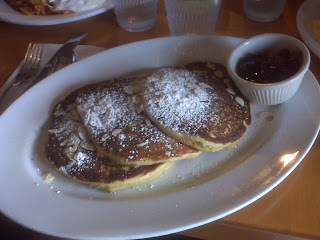 I'd never been to brunch at Hugo's before, and was happy to see gluten free orange cranberry pancakes on the menu! It's not often that I see gluten free pancakes on a menu, so I knew I had to order them. They didn't disappoint and were even better than the gluten filled pancakes I used to eat. They were light and infused with citrus flavor. They were also served with cranberries drowned in a citrus sauce. Altogether, it was a great brunch. Of course there was organic maple syrup at the table too -- because how can you eat pancakes without maple syrup? I've written about Hugo's before (here), so check that post to read more about Hugo's.